Die Lagerbühne ist relativ leicht aufzustellen. Alles passt super und sieht auch noch klasse aus. Wir haben das Modell im Haus in Verbindung mit dem Geländer S als Hochebene im Kinderzimmer aufgebaut. Installation très bien expliquée et très simple à réaliser. Les murs de mon studio ne sont pas droit mais aucun soucis quand même. Can I enquire that, during shipping, what are the dimensions and weight of each packages? our products are packaged in palletized carton boxes which dimensions are 2390x1125x550 mm. Although it is curbside delivery, the pieces are not too heavy separately. I don't understand very well the "Available heights above beams" measure. 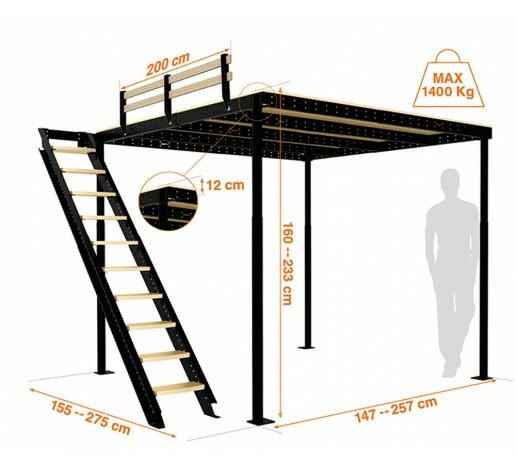 I would like to install the mezzanine with the lower part of the beams at 210 cm. Should I use only the 232cm height? all our structures are height-adjustable every 12 cm. The beams of the TS8 mezzanine are 10 cm tall and the thickness of the floor is 2 cm. 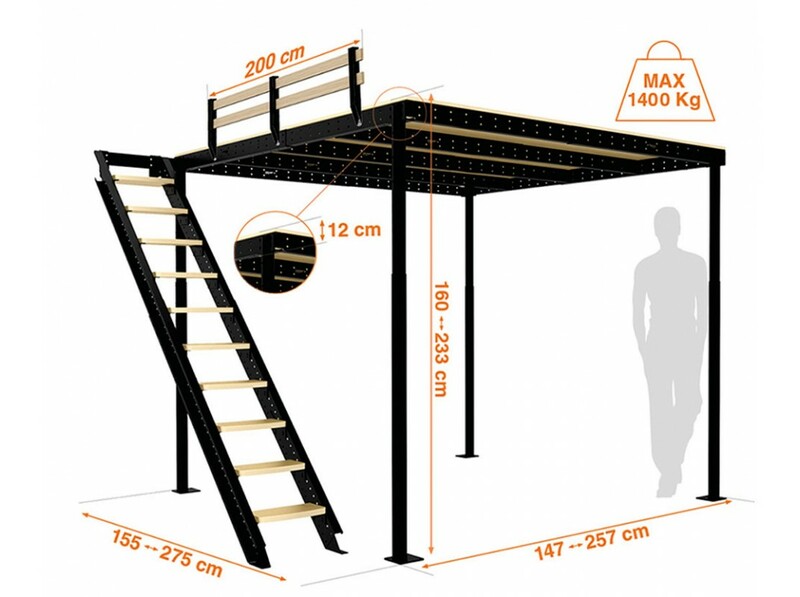 So, if you desire the height underneath the mezzanine to be 2093 mm, the height floor to floor will be 2211 mm. can this product be delivered to the United States? we do deliver our products all over the world. You can check all the prices and features adaptated to the American market. what material is this made out of pls? How long for construction roughly? thank you for showing interest towards our products. This mezzanine is made out of structural steel. Floor board and stairs' steps are made of structural water-resistant wood. Setting it up requires 2-3 persons; should take about 3 hours (a few bricolage tools are needed).